100% heavy brushed cotton twill 74 x 44, structured six panel, mid crown with contrast color Velcro closure, clear plastic closure pull. Pre-embroidered striping down front panels and visor. 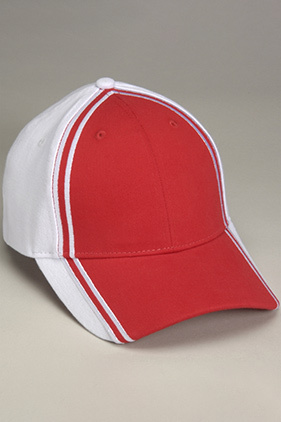 Two-tone white crown with contrast color front panels and visor. Two-Tone athletic appearance. NFL side-line styling.